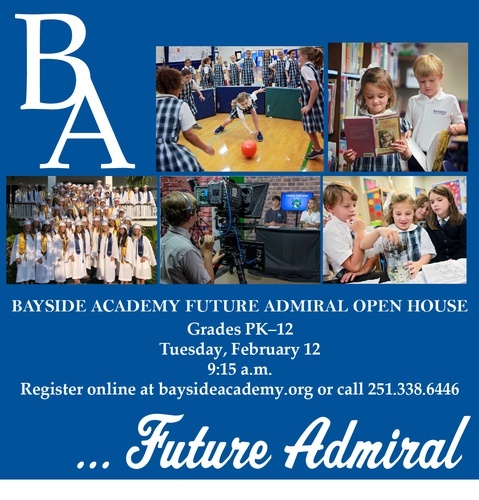 Bayside Academy is pleased to announce a Future Admiral Open House scheduled for Tuesday, February 12 at 9:15 a.m. Interested parents should visit www.baysideacademy.org/admissions or contact Admissions Director Alisa Ascik at (251) 338-6446 or aascik@baysideacademy.org to register for the event. This is the final Open House scheduled for this school year. Come learn about all Bayside has to offer! Bayside Academy is an independent, coeducational, college preparatory day school for students in grades PK–12.